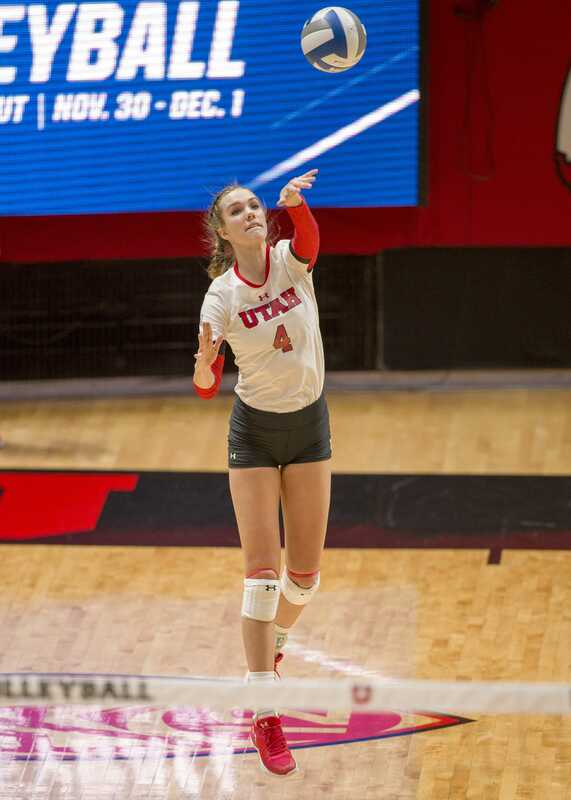 The University of Utah volleyball team had their first match of the week Wednesday night against No. 16 Oregon. The Utes started slow, and couldn’t recover, losing the match in three straight sets. Utah started off the first set with a 3-0 run to take the lead. Holding the lead until 19-15, Oregon took a timeout and changed up the game. After the timeout, Oregon pushed forward and was able to get up by one at 21-20 to take the lead. Oregon continued with their momentum and took the first set at 25-22. Oregon was on fire in the second set and started off by taking a 10-5 lead. The Utes didn’t give in easily and went on a 5-0 run to take the lead at 16-15. Oregon responded quickly with a run of their own to close off the match at 25-21. The Oregon Ducks did not mess around in the third set. Taking control of the set early, Oregon was able to finish off the match at 25-20. Both outside hitters, Megan Yett and Dani Drews, had double-doubles during the match. Yett led the team with 14 kills and also had 10 digs. Drews followed up with 11 kills with 11 digs. The Utes will now be preparing for an upcoming match on Friday, Nov. 16 at 8 p.m. against Oregon State. After last night’s match, the Utes are currently 15-13 in overall play with 7-10 in Pac-12 play. Oregon State is last place in the Pac-12 with an 11-17 in overall play with 1-15 in Pac-12 play. Oregon is currently on an ongoing losing streak of four losses. Last time the Utes saw Oregon State was in the Huntsman Center on Oct. 11. Utah won a nail-biter of a match in five sets. The Utes currently sit at a 10-11 all-time record against Oregon State. The match this Friday, Nov. 16, will be broadcasted on the Pac-12 Network. After Friday’s match, the Utes will be wrapping up their regular season matches. Utah will be at USC on Nov. 21 and will be at home for their last regular season match against Colorado on Nov. 23.